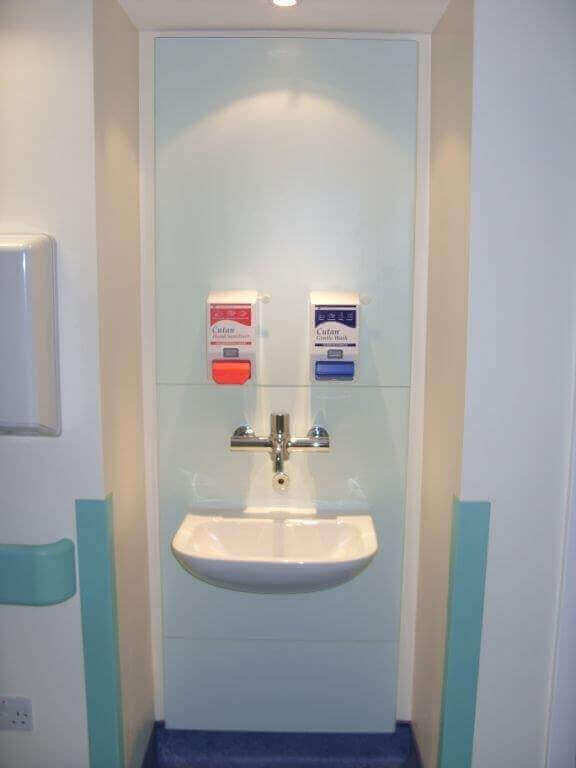 Hygiene and functionality are key factors when designing new washrooms and reception areas for the medical sector to ensure all patients, staff and visitors feel comfortable at the premises. 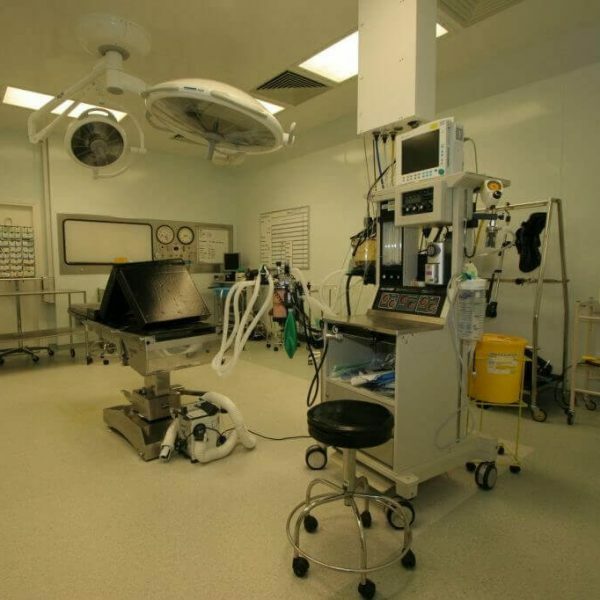 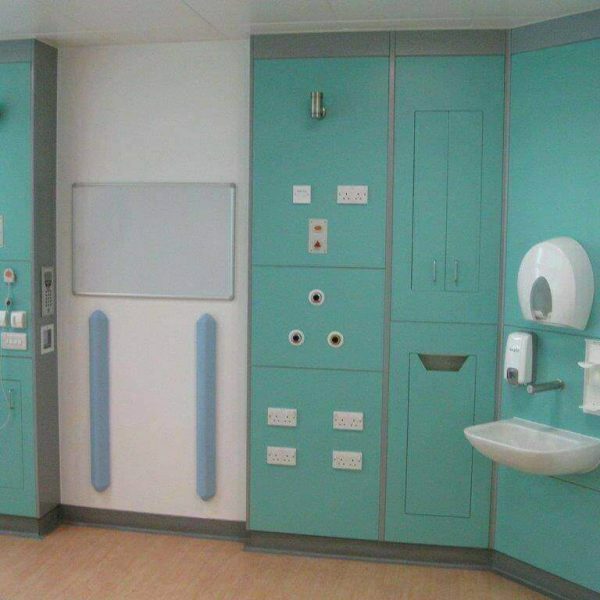 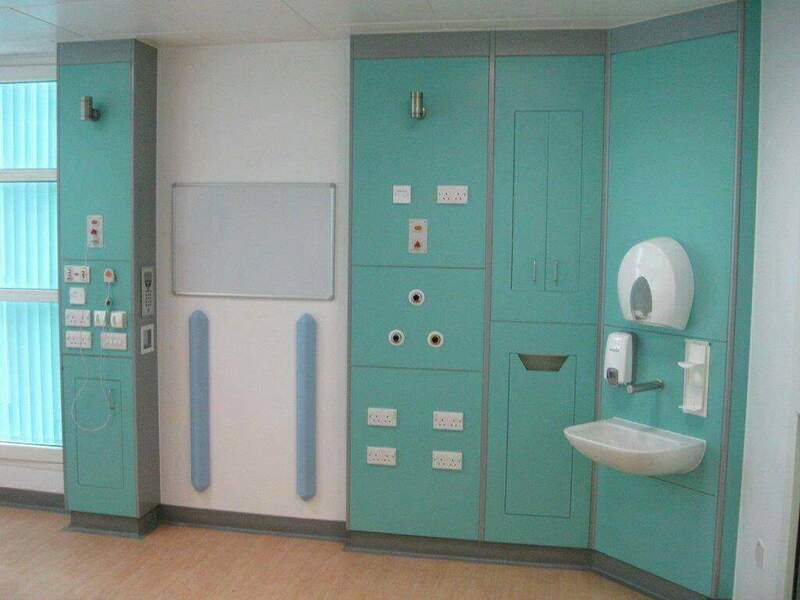 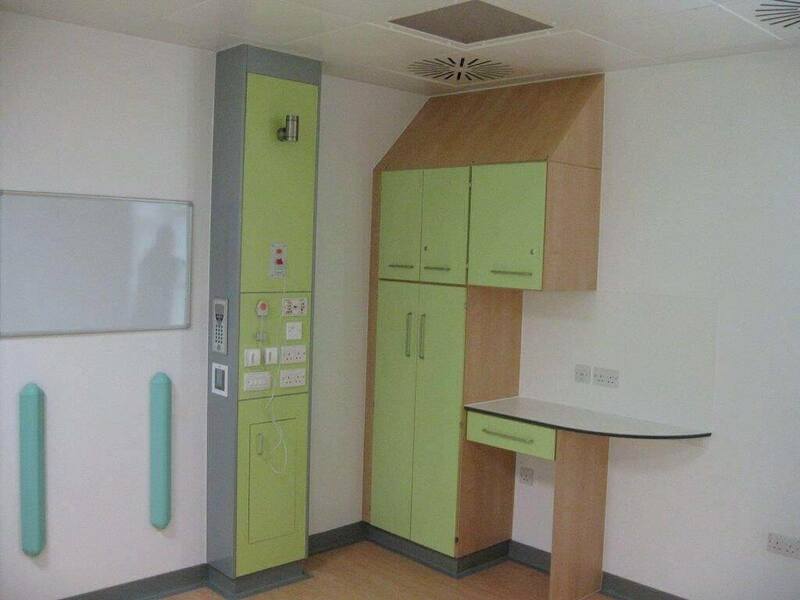 Here at Spectrum Interiors, we specialise in washroom refurbishment and office fit outs for the medical sector, including hospitals, doctors surgeries and clinics across Manchester, Chester and Liverpool, as well as nationwide. 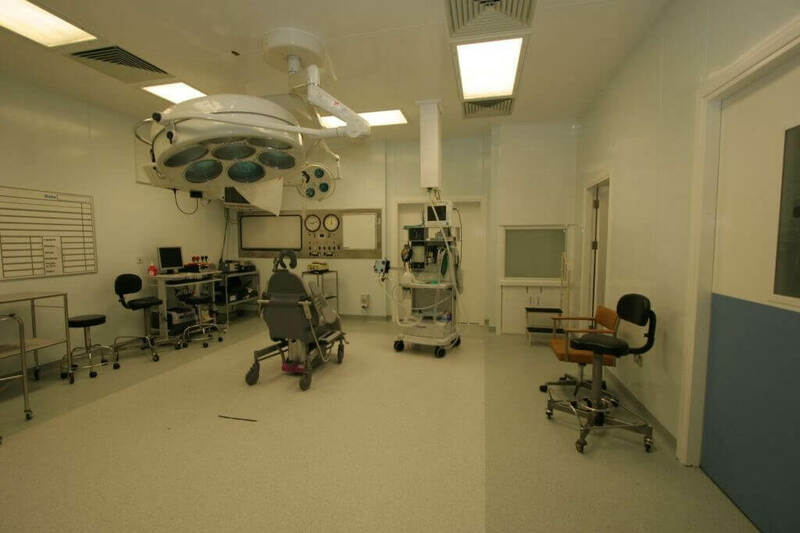 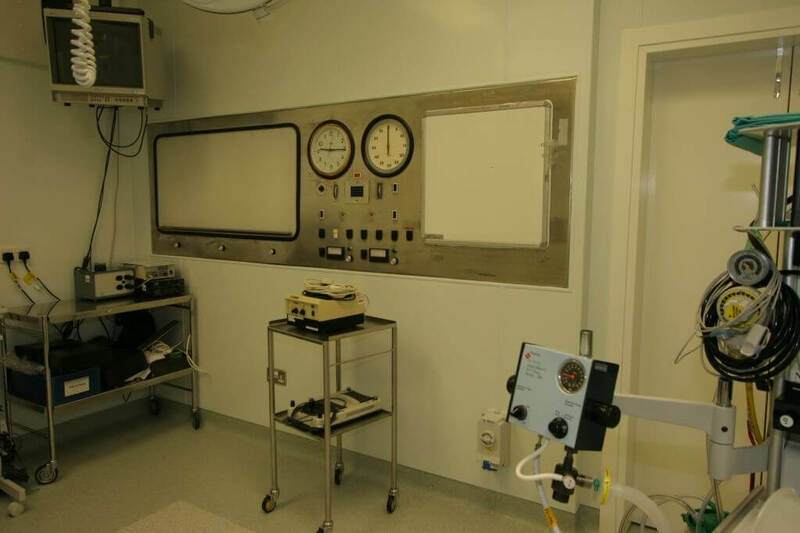 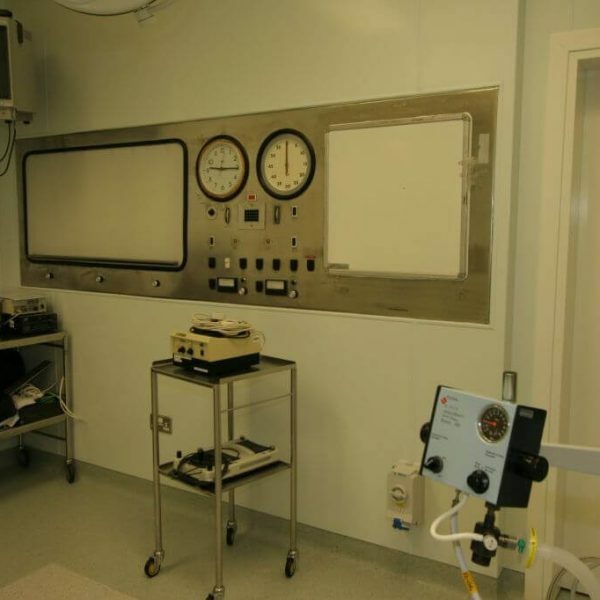 We provide the medical sector with technical engineering and thorough installations tailored to the needs, taste and budget of the client. 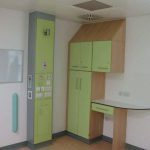 For quality bespoke designs from a supplier you can trust, don’t hesitate to get in touch with our expert team today. 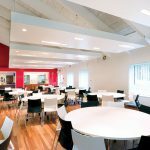 This café at the Education and Training Centre was in need of an update to transform it from a disused canteen to a welcoming, multifunctional space. 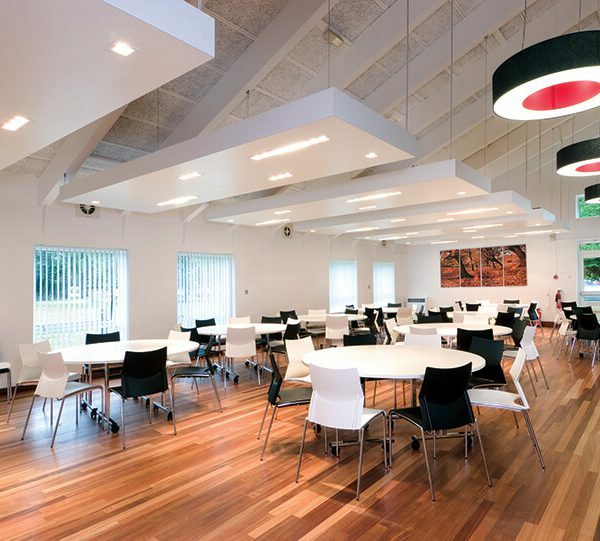 We worked with AFL Architects to design the suspended light panels and to install both the integrated LED lights and circular feature lights. 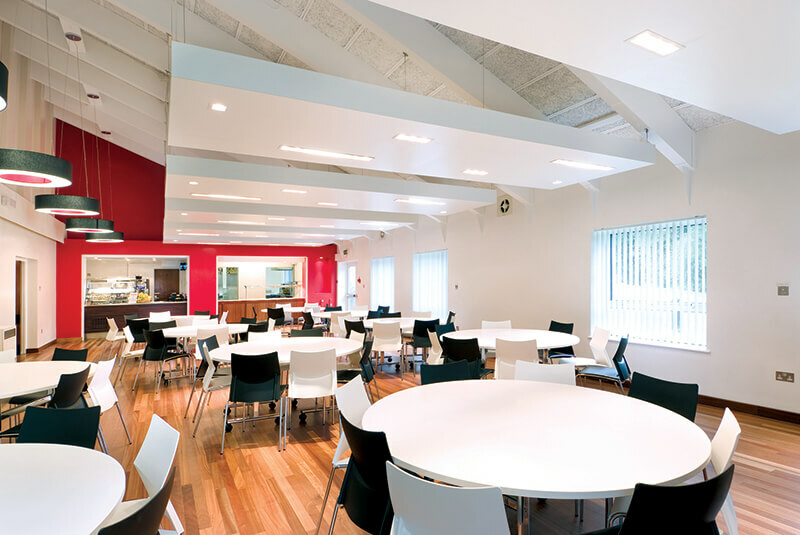 The colossal 16ft long lighting rafts require specialist wire in order to support their weight and are designed as such to reduce the ceiling height to a more personable level suitable for the dining area. 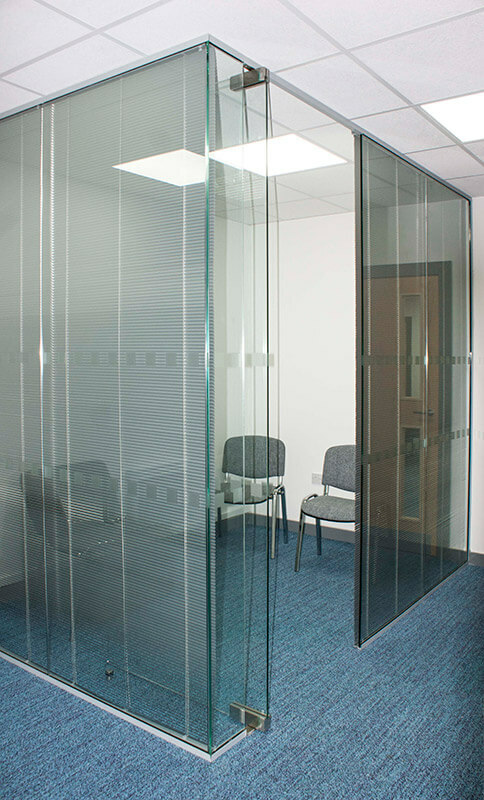 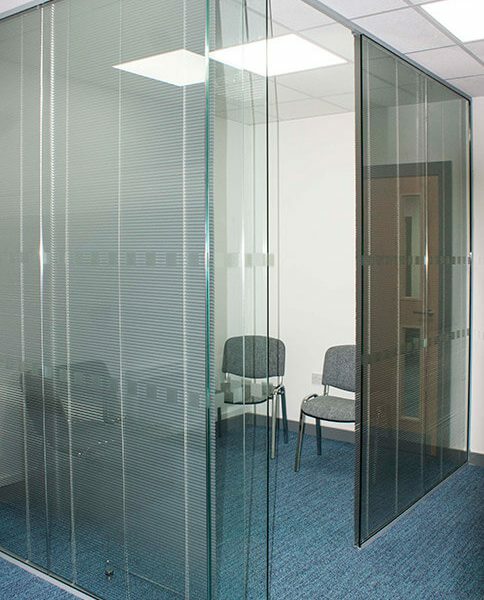 This in turn causes some acoustic reduction; helping to achieve a calm environment. 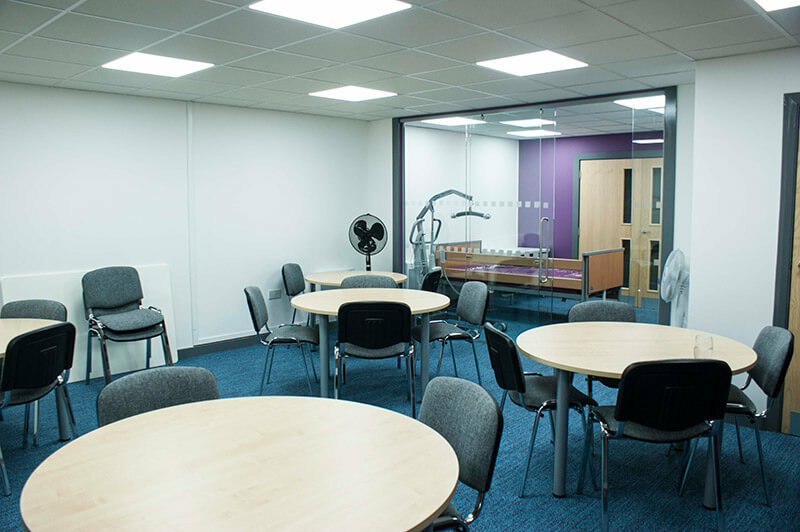 We sourced a mix of LED lights to fit into the panel, which provide an even distribution of light in order to brighten up the space. 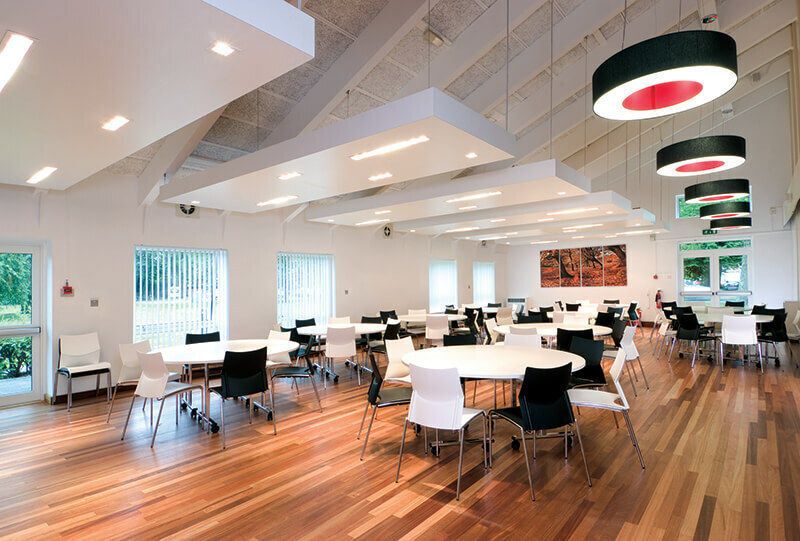 The additional circular lights add variation and work well as a feature to coordinate the colour scheme. 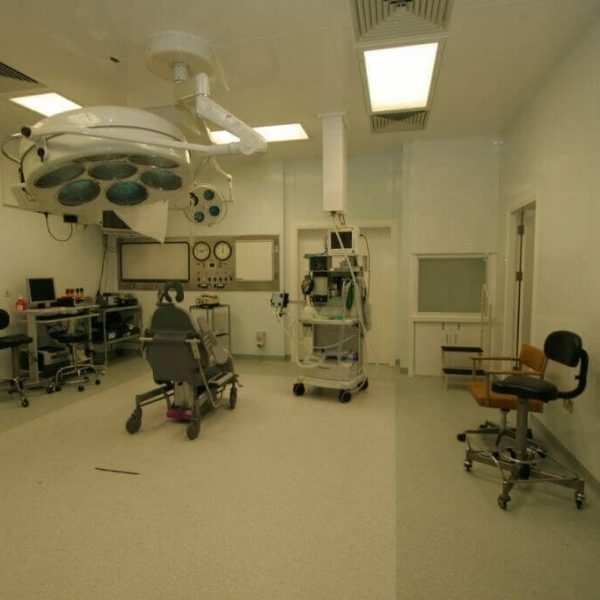 The result is a comfortable, clean space enjoyed by staff and patients in the day, with a high quality finish suitable for the events which are held here in the evening. 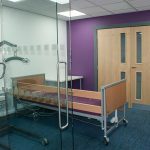 This project was for a company called Nurture Care, who provide social care for children and help them to progress to achieve as much independence as possible. 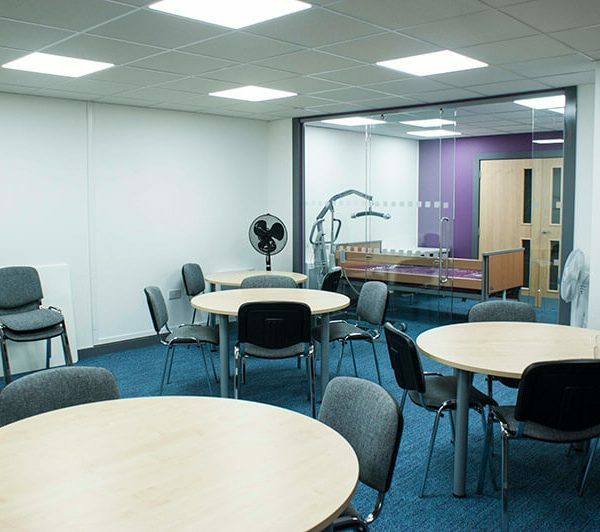 They recently moved into an empty office unit in Nottingham, which was a blank canvas we have transformed into a specialist healthcare training facility. 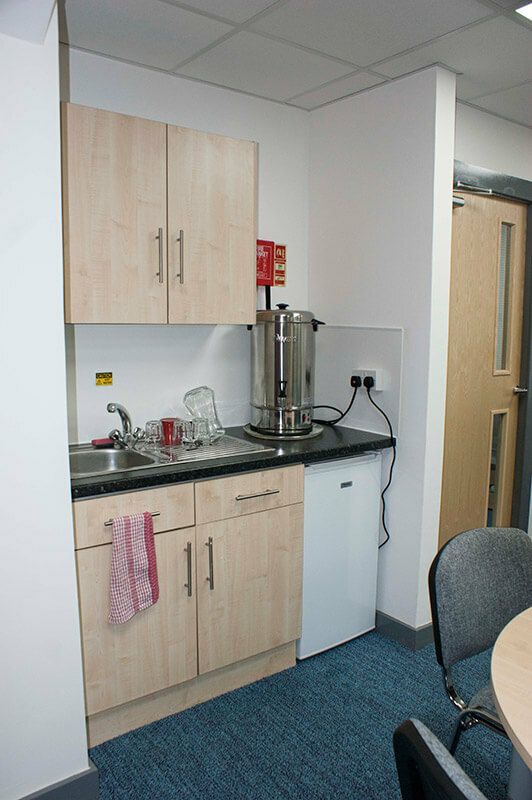 In order to provide the best possible training for staff, Nurture Care have installed the equipment used in the home and care environments. 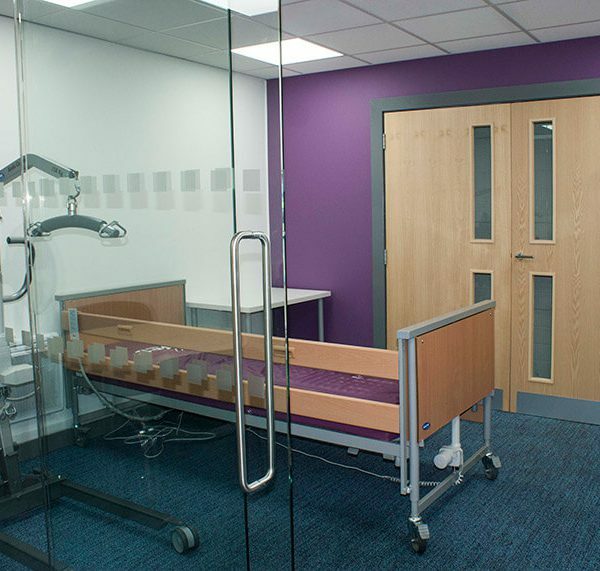 Spectrum Interiors worked closely with Nurture Care on the design, to ensure that we incorporated these facilities. 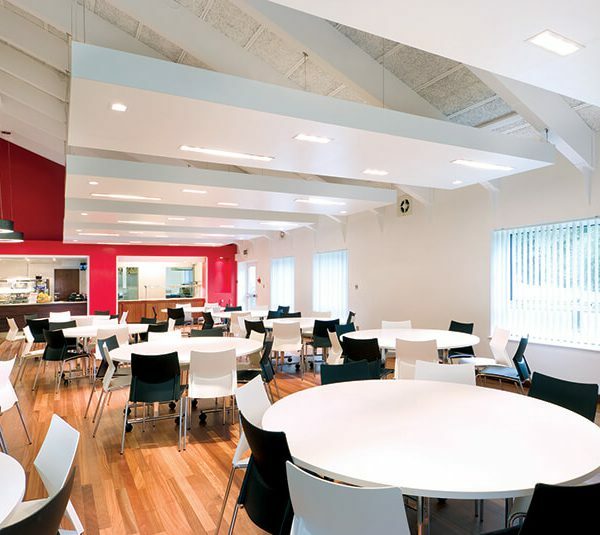 We also completed a number of visuals to envisage how we could achieve this multi-functional space. 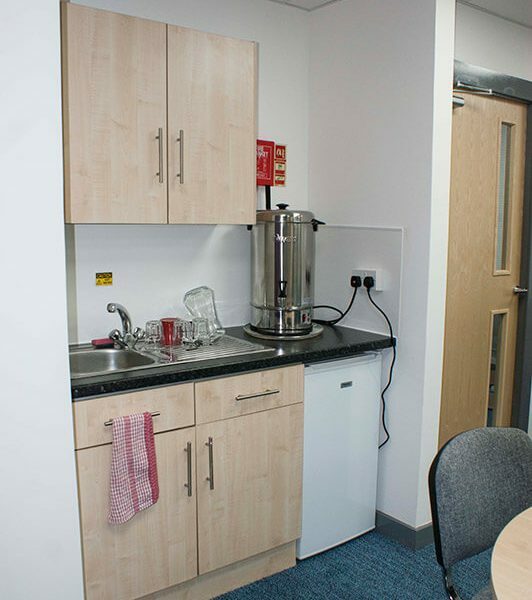 Visiting clients and staff are well catered for, and we have made a practical use of the limited space available to provide a kitchenette, waiting room and private discussion room. 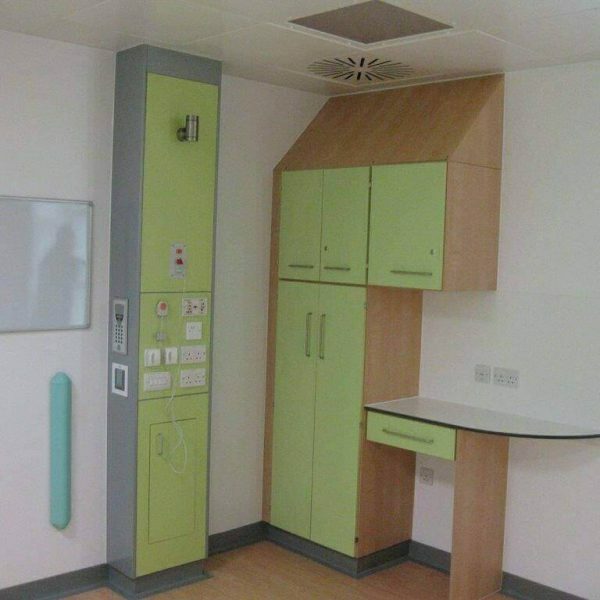 We have created a calm and safe environment for training, which will help to put staff and clients at ease; the colour scheme helps the rooms to feel less clinical and more welcoming for children. 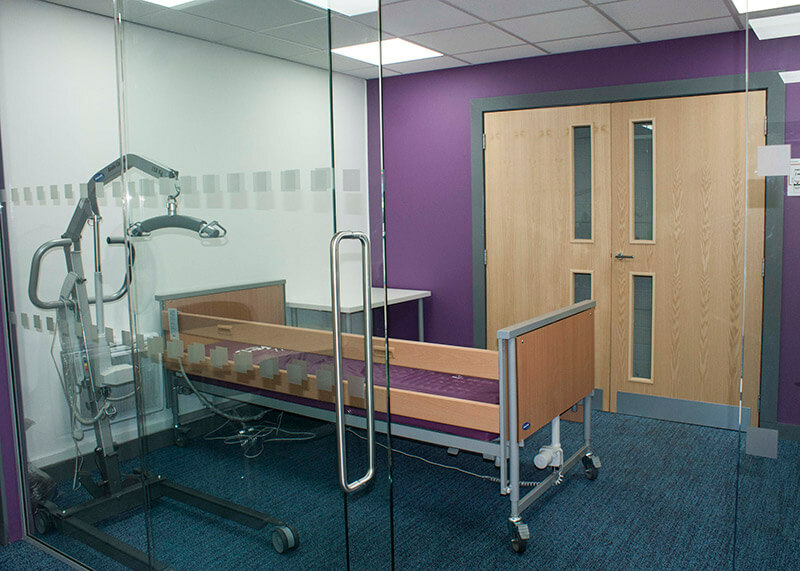 Nurture Care are very pleased with the results! 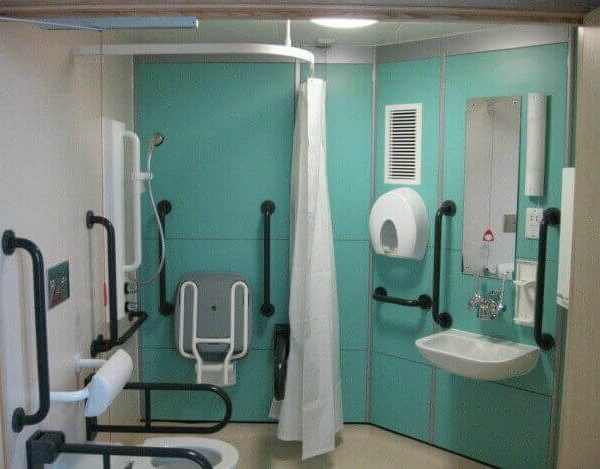 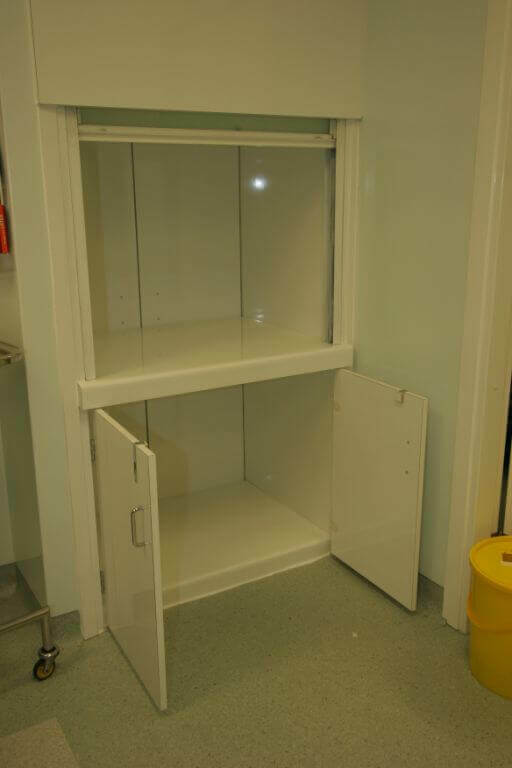 Spectrum have designed and built bespoke units for cancer care wards and fitted out ensuites in these areas for care homes and as part of NHS schemes. 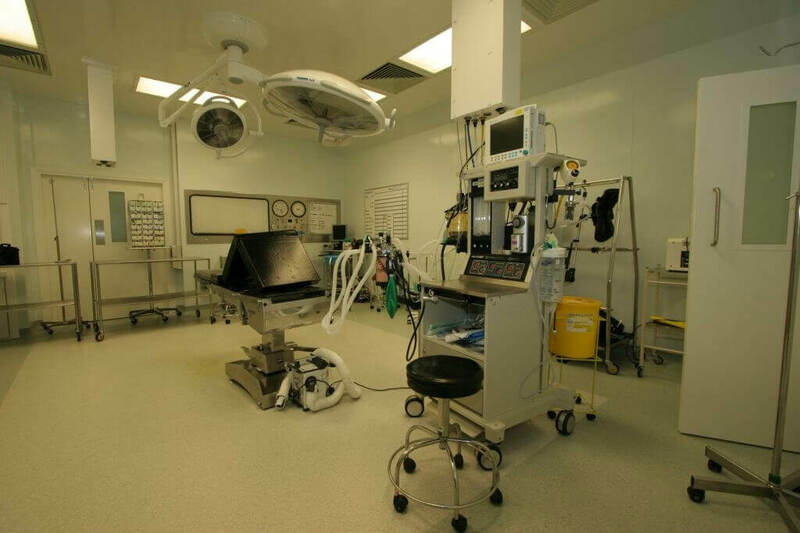 It is critical for the medical sector that these are hygienic places and offer maximum support to patients and visitors also. 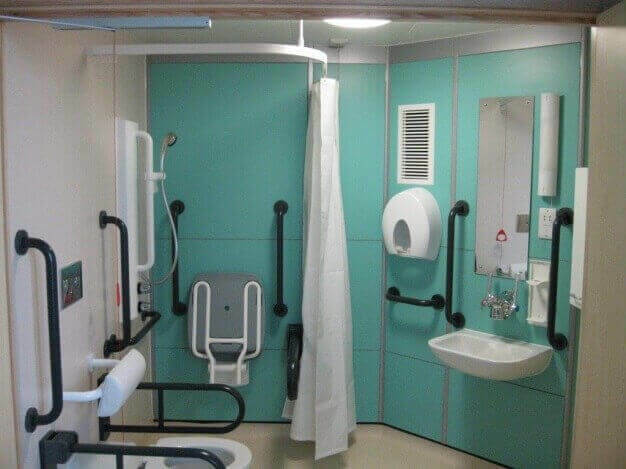 A lot of the panelling systems we make for this kind of use are for handwash stations- concealing pipework whilst minimising risk of bacteria spread. 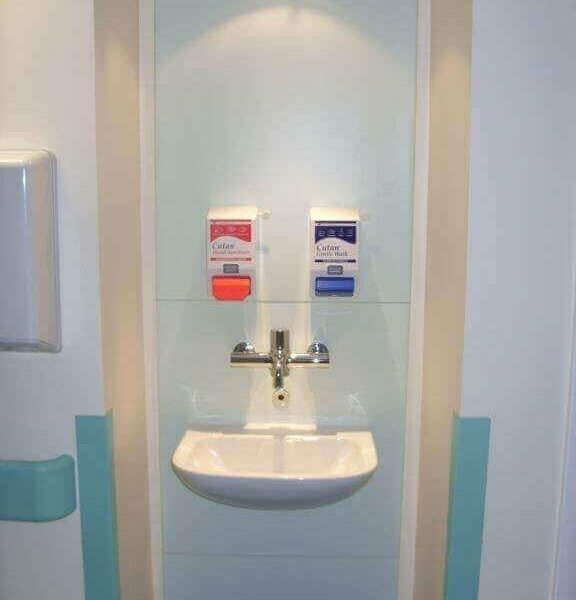 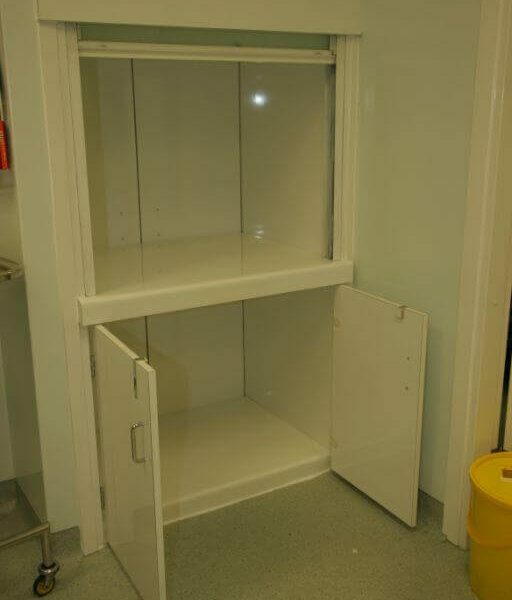 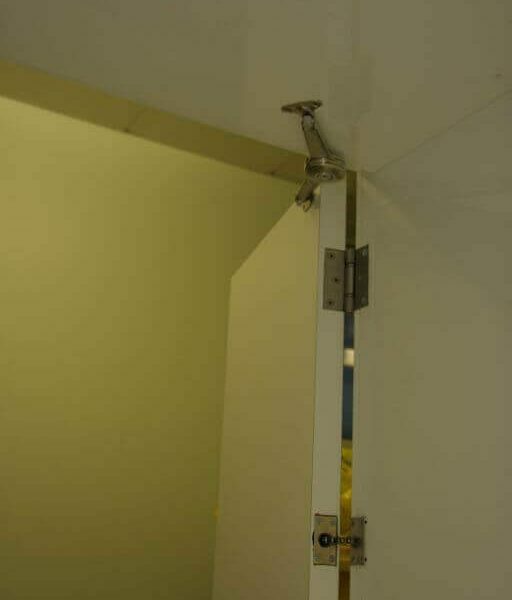 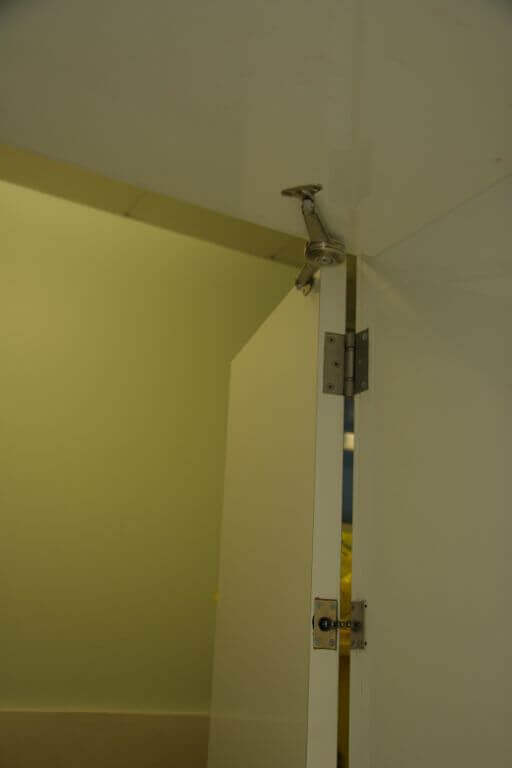 This project had to be designed very accurately to certain specification and installed in certain shifts due to the theatres being high in usage much of the time. 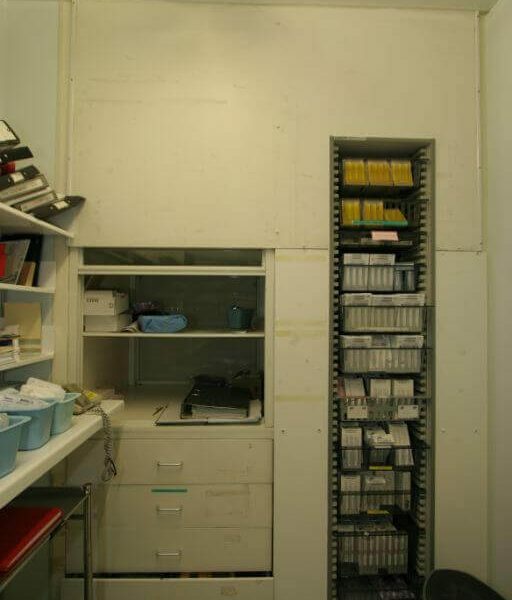 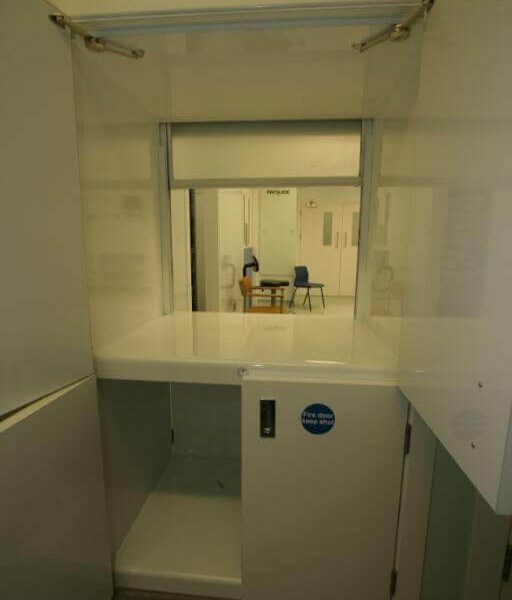 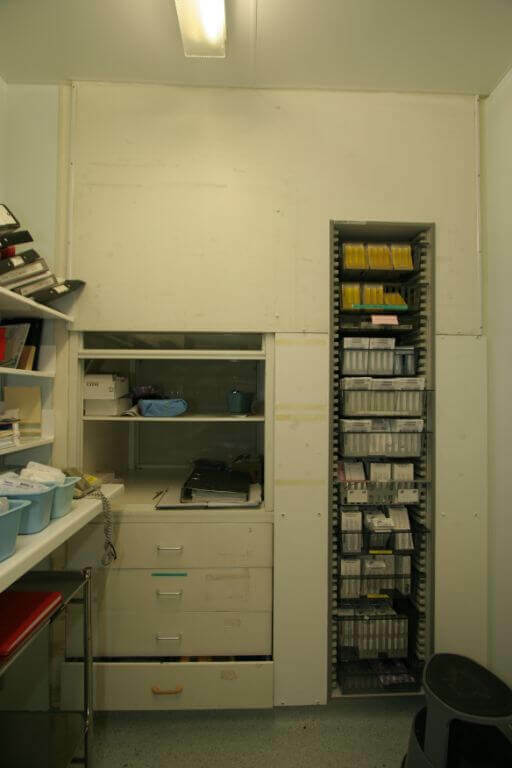 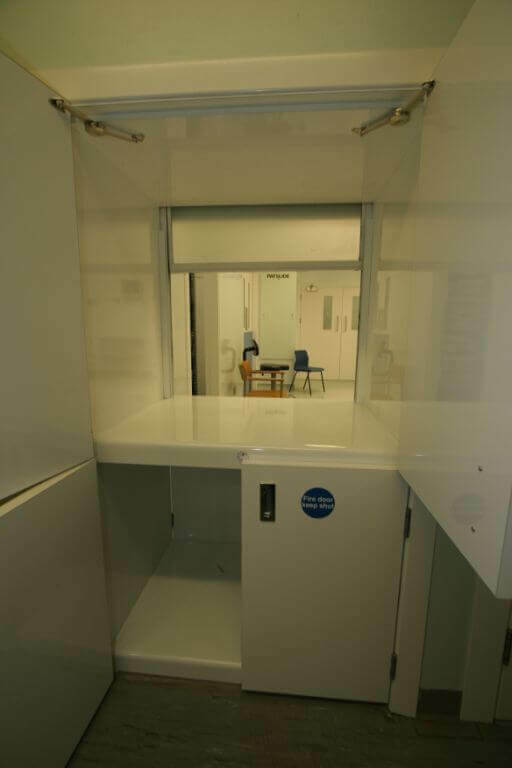 On one installation programme, our team was ordered to pack up and out as soon as possible – there was an emergency operation needed in that room! 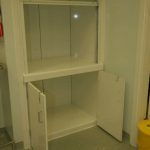 The hatches are smart and functional; they had to be very durable and resilient to everyday demands.